Tony Singh Comes to the Eat & Drink Festival! We would like to thank the marvellous Tony Singh for making his debut appearance at Eat & Drink Festival! It has been a pleasure to have him on board and we hope to see him back again next year! Tony partnered with Love Food Hate Waste (Zero Waste Scotland) to give some fantastic live cooking demonstrations on the Eat & Drink Stage. Tony showed some easy and invaluable ways that we can all waste less food by showing us some recipes that use up leftovers. Finding a use for the morsels leftover in the fridge will also save you money, as you won't have to shop so often when less food goes in the bin! 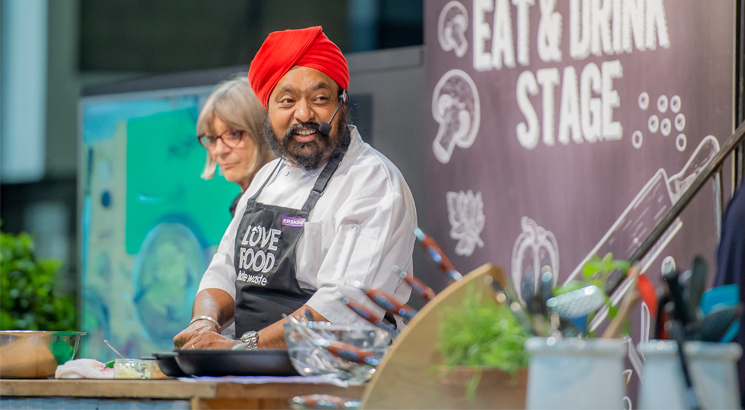 Tony Singh shared his own brand new recipes with the crowd- including Quesadillas, Salsa Roja and Bakery Pudding - all using common leftover foods! Every year in Scotland we throw away over 600,000 tonnes - or £1 billion worth - of food from our homes. That’s £460 a year, or £38 a month, for the average Scottish household. We could all save money by making a few changes and by getting our hands on ingenius recipes like Tony's! If we saved all the wasted food in Scotland that could have been eaten each year it would have the same positive environmental impact as taking 1 in 4 cars off of the road! That's a big difference! If you missed Tony's demonstrations, you can still visit Love Food Hate Waste's stand L520 to get recipes and ask for tips! They even have a cool interactive fridge and a competition to win 1 of 4 ‘Eco Survival Packs’!